And the winner is....I can't tell you that yet! I reckon if you read on it shall be revealed. First you get my disclaimer. As beautiful as show dogs are, I can't help but get that sinking feeling when I contemplate what some of their lives are like. Please understand that I know they don't all live this way, but here's one story that will make you shiver. Never allowed to socialize or run free at a dog park, for fear of getting dirty or mussing his 'do', a beautiful Golden Retriever show dog was left crated until his showing days were over. An acquaintance of mine was lucky enough to adopt this older, retired show dog, after it was no longer winning. The original owner had no more use for this beautiful specimen, as she referred to it. My friend took the dog in after it was given up to its veterinarian, and has had quite a job socializing it at this advanced stage in its life. Sadly, this dog with the reputation of a social butterfly, had no social skills whatsoever. It is stories like these that taint the show dog world. I much prefer the ones where I hear that a dog is owned, trained, handled and shown by the same loving person who enjoys the dog's companionship and includes the dog in his or her life. Too bad they can't all be this way, but to be sure--many are fortunate in this way. But I digress. You must be reading this post to learn the winner's breed and possibly a few tidbits about the competition, and my job is to report it. I wish i could explain why the airing of the show had to wait nearly two months after the actual event, but alas the live event must have taken a back seat to football. Not surprisingly, today's big game between the Green Bay Packers and the Chicago Bears will likely get more viewers of the male gender, while us dog lovers (I know some of you are guys!) were be tuned in to ABC to watch the National Dog Show. My big question in watching a show like this is always the number of dogs that start the competition, only to be left behind in advancing rounds. Today's champion had to beat out nearly 2500 other dogs of all breeds, including the new additions to the AKC lineup, such as the Leonberger--one of my personal faves. I was encouraged to learn that this year's winner is co-owned by Leslie Frank. This lady was the recipient of the 2010 AKC Breeder of the Year Herding Group. I felt a little of the lump in my stomach release on learning that she is a respected and revered breeder, not that I would have expected this winner came from a puppy mill. Ack! You might get a chuckle out of knowing that one of the co-hosts of today's championship is an announcer for World Wrestling Entertainment. How funny is that?!! His enthusiasm turned out to be a nice addition to the MC team. I have to admit I was caught up in answering the trivia questions and rooting for my favorites. Who were they? I'll never tell! For me, it's more about the twinkle in the eye than the perfectly groomed exterior. 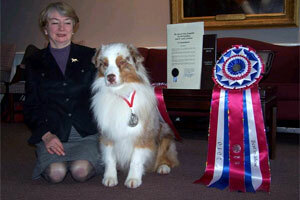 I know my agility friends, must have been shouting for joy when Reckon, a striking Australian Shepherd, won the crown. Actually it was more of a monster-sized ribbon. You can view more pictures of this buff boy at the AKC site at this link. I hope you enjoyed the show and were able--as I was--to momentarily put aside your desire to encourage rescuing, in favor of the roots of rescue dogs--purebreds. They clearly are eye candy for the dog lover. If you're a blogger, stop in and add your photo post of your Super Dog to our hop, and your thumbnail photo will appear on the blogs of everyone that participates. Add the code to your own blog, and you can help spread the fun, while showing off the entries on your site. Follow the links to all your favorite pictures and blogs. Comment on your favorite posts and photos. Stop in at my Facebook page to see photos posted there by those who are not bloggers. Send me your dog's picture with a football, jersey, or any football themed photo of your dog. My email is LetsAdoptaDogPark@gmail.com. I'll be happy to post your photo to my FB page myself. See you Sunday, February 6 for Super Dog Sunday! the super sunday blog hop sounds fun!